The top model in IQAir HealthPro Series, the HealthPro Plus combines top-grade HEPA filtration with a separate filter cartridge that removes VOCs, odors, and gases present in your home air. Covers 1125 sq ft offering 2 air changes an hour. The most advanced model in IQAir HealthPro Series, the HealthPro Plus combines top-grade HEPA filtration with a separate filter cartridge that removes VOCs, odors, and gases present in your home air. Covers 1125 sq ft offering 2 air changes an hour. The HealthPro Compact is a smaller unit and does not have a location for the V5-cell filter; therefore, it cannot be upgraded at a later time to have added VOC, gas, and odor protection. The HealthPro has the spot for the V5-cell and has the ability to be upgraded to the Plus model simply by adding the V5-Cell at a later time if you wish to do so for added VOC, gas, and odor protection. HealthPro Plus, most comprehensive of the HealthPro Series, includes the V5-Cell for added VOC, gas, and odor protection. Like the rest of the HealthPro series models, the Plus uses IQAir’s HyperHEPA filter, which can remove 99.5 percent of all particles as small as 0.003 microns. At this filtration size, a HyperHEPA can target even the smallest bacteria, as well as many viruses. Of course, it is also highly effective at eliminating dust, mold, dander, pollen and other such common contaminants. What makes the IQAir HealthPro Plus different from the other models in this series of air purifiers is the addition of a V5 gas and odor filter. This filter adds to the already remarkable capabilities of the Plus model by allowing it to remove pollutants in your home air that no HEPA-type filter, no matter how fine, can catch. Like other models in the HealthPro Series, the Plus uses a unique design to minimize noise while maximizing efficiency. The unit’s fan is contained within a vibration-dampened housing that prevent noisy shaking, and is also quieted by the surrounding filters. 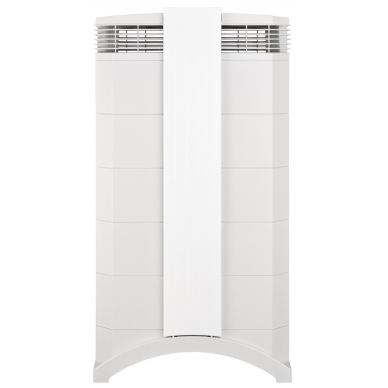 In addition, the Plus makes use of UltraSeal 360, IQAir’s proprietary sealing design that prevents contaminants from evading the filter by leaking out of the air purifier housing. Though it is great for allergy sufferers or those who simply want to improve their health through cleaner home air, the HealthPro Plus is one of the best solutions on the market for those who suffer from asthma. Since either gaseous or particulate contaminants can trigger an asthma attack, an air purifier designed to minimize asthma symptoms must be able to remove both. Additional features include a remote control, built-in timer and rolling casters for easy movement around a room or home. Like all HealthPro air purifiers, the Plus is tested at the manufacturing facility to ensure proper operation. The unit is also covered under a limited 10-year manufacturer’s warranty. filter, the filter selection needs to be confirmed twice by pressing the Enter key. seconds in a menu window, the display will revert to the main display window. the Menu key seven times. selection to appear is the Pre-Filter. Release the Enter key. for the appropriate filter is currently flashing red. 4. Press the Enter key to confirm that the selected filter has been replaced. Reset window, press the Menu key. light on the control panel will change from red to green. Download IQAir Quick Start Guide here. 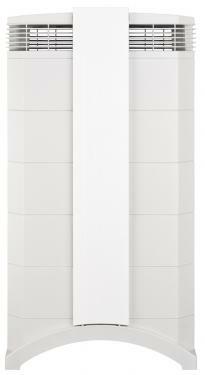 Download the IQAir Air Purifier Product Brochure here. Download the American Lung Association Brochure here. Need help choosing which IQAir unit to buy? Visit IQAir\'s handy guide here. Download IQAir GC MultiGas Manual here. Download IQAir HealthPro Series Manual here. Download IQAir HealthPro Compact Manual here. 5.0 Excellent customer care 01/02/2018 By Gerald Martin I was thrilled with the responsive, personal customer care. Having a knowledgeable product representative was a great start. 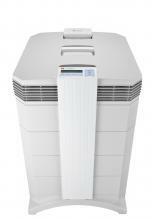 Delivering the purchase of air purifiers ahead of schedule and before the Christmas holiday was a fantastic finish! I'll be back!